Together with our cooperation partner SolarSpring GmbH a first energetically self-sufficient system for drinking water treatment and supply was implemented in New Delhi. The system supplies the health and educational center in Basti Hazrat Nizamuddin of the hope project with safe drinking water. 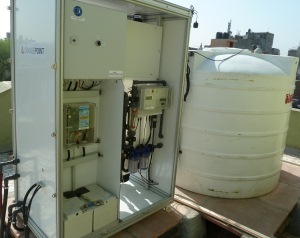 Additionally to that, the water can be supplied to the public living around the complex. 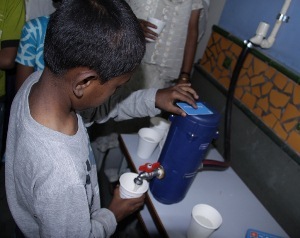 SuMeWa|SAFE assures drinking water quality after the water has been ultra-filtrated. Thus the water can safely be tapped and distributed. For the first time also a “prepaid public water tap” was tested. This unit permits the institutionalization of decentralized drinking water supply and can guarantee equitable distribution of the water. In the future, this water tap would allow the implementation of a simple and cost efficient payment system for drinking water. AUTARCON and SolarSpring GmbH plan to strengthen joint activities, as the technological units can optimally be combined. Here you will find further information about the Hope foundation and it is work. Here you will find further information about our cooperation partner SolarSpring GmbH.